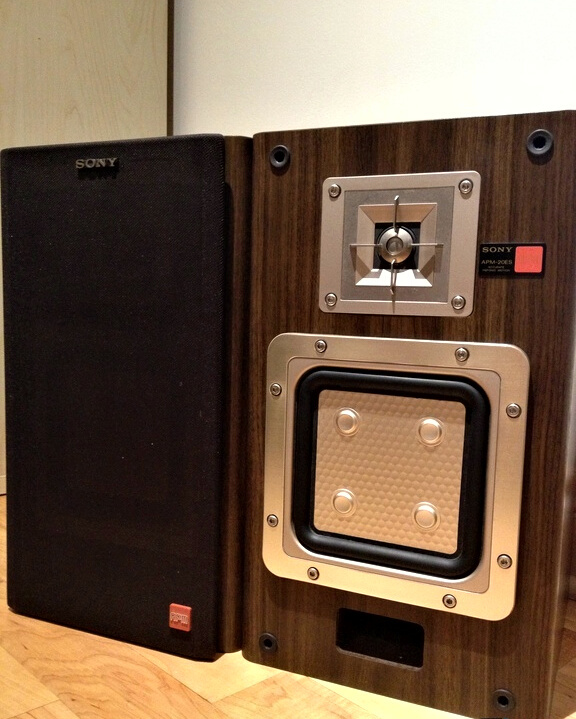 Home » All Products » SONY APM 20ES Loudspeakers. What are the major design features of Sony’s Accurate Pistonic Motion speakers? One key characteristic is the use of flat drivers. Flat diaphragms have a major advantage over traditional cone-shaped drivers. In cone-shaped drivers, the outputs from opposing surfaces of the speaker cone interfere with each other, causing inaccurate frequency response. This is known as the “cavity effect”, and it’s an inherent abnormality of the cone shape design. Beacuse flat diaphragms like the APM driver are not prone to this type of distortion, you hear a speaker with more linear frequency response. Honeycomb Construction with Four-point Drive. To ensure that these compact drivers won’t lose their shape when presented with powerful sonic modulations, Sony APM drivers feature an innovative aluminum honeycomb design permits the APM drivers to resist bending – a major cause of distortion in typical paper drivers. Yet the aluminum honeycomb is light in weight for superb transient response. For these reasons, several speaker manufactures use aluminum honeycomb construction. However, only Sony uses square diaphragms and four-point drive to further eliminate potential nodes of vibration. In this way, distortion is reduced to the vanishing point. With all the impressive technology built into the ES Series, it would be a shame to spoil the final enjoyment of the music by using a loudspeaker incapable of matching the system’s sonic performance. Yet, that’s exactly what would happen with many of the most popular spaekers on the marked today. Very few of them are designed to handle the extremely wide dynamic range that’s an important part of PCM, Compact Disc, and beta Hi-FI sound. And almost none can reproduce the full spectrum of the audio frequencies without severe inaccuracies and distortion. Even something as fundamental as clean, uncolored bass response is beyond the capabilities of most speakers.